On August 7 I reported that the Trump administration had loosened restrictions on products containing asbestos, which is totally banned in 60 countries because the material is a deadly carcinogen. According to the new rules, asbestos-containing products can be created or imported into the U.S. on a case by case basis. Now, according to a report by the Environmental Working Group, which seems to be a bit kooky (they’re in favor big time of GMO labeling, for instance), asbestos imports are starting to rise dramatically: 2,000 percent (20 fold) between July and August (click on screenshot below). Most of them, as the graph further below shows, come from Brazil. We don’t need to use asbestos, as there are safe substitutes. There were about 3,000 deaths per year due to asbestos in the 15 years before 2015, most from mesothelioma, a deadly form of cancer that can show up decades after a small amount of the product is inhaled. And it’s a horrible way to die: I’ve seen it at work. The EPA should ban it, but lobbyists from the chemical industry are pushing to keep a ban from being enacted. This entry was written by whyevolutionistrue and posted on October 27, 2018 at 1:30 pm and filed under environment, health. Bookmark the permalink. Follow any comments here with the RSS feed for this post. Both comments and trackbacks are currently closed. Thanks muchly for that. The world always makes more sense after Ms. Cunk explains its details. Any question in anyone’s mind about which one — pro- or anti-asbestos — is better for Donald Trump’s personal bottom line? I mean, what’s a little thing like 3,000 human deaths from mesothelioma per annum compared to something crucial like that? It’s hard to believe that the man can still disappoint me. I’m pretty sure he hates windmills for a very good reason; for him, venturing too close would result in a quite literal hair-raising event. When Jerry last wrote about asbestos, I did too. I included the quote in that clip in my post. 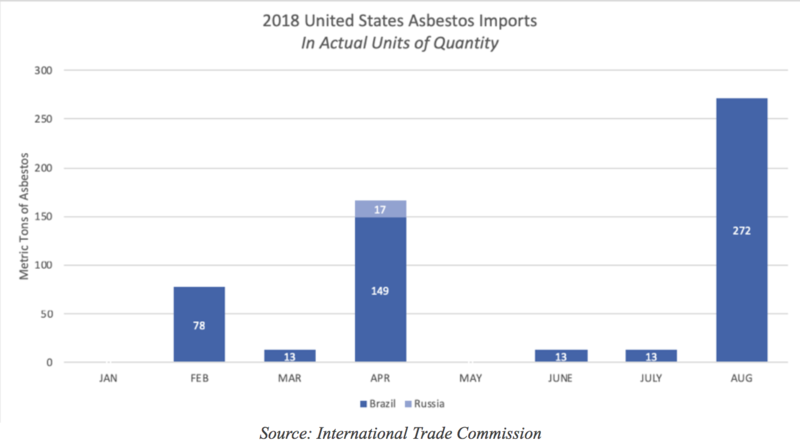 Most of the asbestos may currently be coming from Brazil, but that won’t last much longer as Brazil is in the process of banning it. The only major miner miner of asbestos these days is RUSSIA, and the main company is putting pics of Trump on their packaging and thanking him for the move by the US. Yes, you read that right. The evidence is in my post. So this BS about the World Trade Center not burning down if it had asbestos? The Twin Towers were chock full of asbestos! There was more asbestos in the Twin Towers than all the other Port Authority buildings put together! Is the issue here about fire in the insulation or the impact of a fully filed and loaded Boeing 767? If this was about Grenfell, an argument might made but in this case…? I haven’t read the links, but iirc, the Twin Towers did have asbestos. It either wasn’t correctly applied, or it had fallen off and no longer covered the girders (or whatever they’re called) fully. Therefore, there wasn’t enough to stop the girders melting. From memory, ‘fallen off’ is not quite the full picture, I think much of it was knocked off by the impact. But I also seem to recall there was some debate about this. That is how I understood it. And in any case the conditions at the impact points were demonstrably like a blast furnace with jet fuel, other flammables, and the setting up of very strong air currents. This built up and then persisted without abatement for an extended time. All it took was to soften some load bearing girders just a little so their bolts pulled out. The rest was gravity. If the central lift shafts were involved I would imagine there would be a very strong chimney effect. It’s extraordinary how powerful the effect can be if the ‘chimney’ is well fueled. In the early 1990’s I was a computer programmer working for the Asbestos Management Department within the Risk Management Division of the Port Authority of NY and NJ. The job of our department was to monitor the existing asbestos in all the PA buildings through air sampling and bulk sampling, determine when asbestos conditions were dangerous (“friable” material detected in the air), and contract the necessary abatement companies to remove it. I set up and managed the database of asbestos lab samplings. I would estimate that roughly 80% of the asbestos we monitored was in the Twin Towers. I’ve had training for working in an asbestos environment and it’s banned in these countries for good reason: if you are genetically predisposed to asbestos, only a single fiber in the lung is enough to set it off. No fun whatsoever! Unfortunately many of the substitutes are inferior in their mechanical properties, or more expensive. For example, asbestos sheet building panels – the substitutes are weaker and less rigid, meaning that you can’t just drop-in replace an asbestos deck panel with another because the replacement is either thicker (hence too heavy for one person to lift) or won’t span the same distance between supports (meaning additional support has to be constructed). Insulation – asbestos is fire-resistant, many substitutes aren’t. I’m not arguing in favour of keeping asbestos (too many fishhooks downstream) but just pointing out that substituting [some other material] isn’t always straightforward. It’s a pity that so many materials that have the best engineering properties turn out to be hazardous. Cadmium is another example. Your comment has no bearing in this instance because the entire increase in US asbestos imports [shown in the graph in the OP above] is for the sole use of the chlor-alkali process – the electrolysis of common salt to produce chlorine and sodium hydroxide [vital substances in the chemical industry]. The other two processes seem to be similar in terms of costs etc, but I assume there are industrialists who use the diaphragms & are rather bothered at having huge chemistry sets on their hands that are now just piles of scrap. Since asbestos fibre is so unsafe & very hard to dispose of it seems obvious the industry will have to find a substitute diaphragm or switch process. Well, asbestos came out of the ground so why not put it back there? So far as I know it’s not going to react with anything or leach into groundwater. The proviso is that it should be buried in a designated exclusive place, not mixed elsewhere in the landfill. Transporting it to the landfill (or anywhere else) is likely to be the most hazardous part of the process. I’m happy with asbestos waste treated into blocks & buried in designated hazardous waste sites [where the geology is understood too], but nothing less than that. The stuff is a nightmare forever, equal or worse than heavy metals. Most asbestos in the UK is still unidentified & just lying about under new buildings or shallow general landfill for household waste. We’ll be discovering this stuff for many generations. If asbestos is fully contained, it is not dangerous. Only when inhaled. I live in an area that was once an asbestos ‘hotspot’ where many of the cases were (Johns Manville, Ruberoid). Old timers describe the situation as air so thick with asbestos dust that you couldn’t see across the factory room. How is that kooky? People like to know about their food sources. Even if you discount possible health issues from typical GMO farming practices (e.g. Roundup in your food), there are environmental issues as well. Being overly cautious and wanting information is even more understandable now that the EPA is in less than reputable hands. I wouldn’t describe the chronic anti-GMO panic in Europe, fueled by hate to Americans, as knowledge or striving for knowledge. Most people don’t want any GMO, because they have been brainwashed that it is bad. The same people have no clear idea what a gene is.